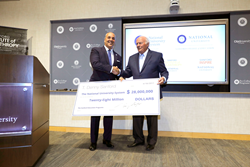 South Dakotan and entrepreneur T. Denny Sanford, one of the country’s most generous philanthropists, is donating $28 million to the private, nonprofit National University System to further its role leading the national adoption of three initiatives: Sanford Harmony, Sanford Inspire and the Sanford Institute of Philanthropy. Based on the vision of Mr. Sanford, the three Sanford Education Programs provide innovative, research-based solutions designed to address critical needs in teacher education, PreK-12 instruction and nonprofit fundraising. The donation, which is the largest ever received by the National University System, ensures the continued expansion of all three programs, which give people the tools to develop better relationships. “I am confident that the Sanford Harmony program will lead to stronger and healthier relationships among children while fostering positive, lifelong relationships and ultimately lowering divorce rates,” said Mr. Sanford.